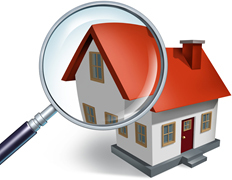 The Termite Inspection involves inspecting all accessible areas including exterior, interior, roof void, sub floor, fences, landscaping and outbuildings. We report on the presence of active termites, previous termite damage & moisture levels. We also comment on vulnerable situations and how to reduce the rate of termite attack. Is in accordance with industry standards – AS3660.2. 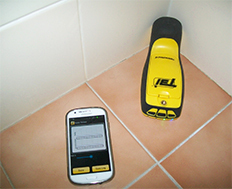 Used to detect live termite within concealed areas. Termatrac is a breakthrough development invented in Australia similar to radar. Termatrac is the exciting answer to the detection of termites. It detects & tracks termite activity through timber, brick, concrete, plasterboard and other common building materials with no interference to the building material or termite activity. A picture says a thousand words. Infrared thermography is the only diagnostic technology that lets you instantly visualize and verify thermal performance. 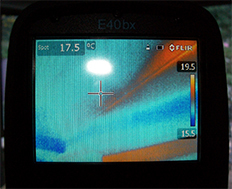 An infrared camera is a non-contact device that detects infrared energy (heat) and converts it into an electronic signal, which is then processed to produce a thermal image on a video monitor and perform temperature calculations. This means that larger areas of termite activity can be detected when they may otherwise be missed using other tools and normal inspection procedures. 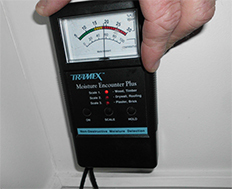 The Tramex moisture meter is a useful aid for determining the presence of termites concealed behind thin wall panels, but it only detects high levels of activity. Older damage that has dried out will not be recorded. A borescope is an optical device consisting of a rigid or flexible tub with an eyepiece on one end, an objective lens on the other linked together by a relay optical system in between. It is a tool that is used to view areas that would otherwise not be visible. The inspector will use when required. Requires a hole to be drilled in the surface material.